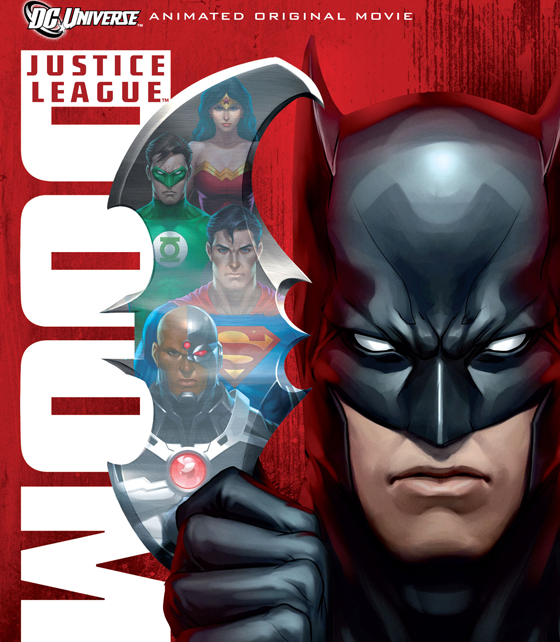 The newest in a long line of very good animated feature from DC Universe Animated is Justice League: Doom. It should tell you how popular these films are getting, because I went to four different department stores to find it on Tuesday. Target was out of both the DVD and the Blu-ray (was on sale for $12.99 and $16.99, respectively), Wal-Mart was out of both, Meijer sold all of their Blu-ray copies, and finally finding it at FYE for $19.99 on Blu-ray. Honestly, it was well worth the twenty bucks. The film is loosely based on the “Tower of Babel” story arc that ran in Justice League of America #43-46. First off, I got the DVD/Blu-ray combo pack, which included a free Ultraviolet digital copy to download and play on my computer, iPod, etc. That way, no matter where I am, I can enjoy it anytime I want. That is a big bonus for me. Secondly, I got a bunch of good special features on the Blu-ray that you really don’t get any more on DVDs. There is one on Cyborg’s increased stature and raised presence in the Justice League, more than likely also tying into DC’s decision to include him in the New 52 Justice League. There is a sneak peek into the next animated movie, Superman VS. The Elite. Then there is a documentary called “Guarding the Balance: Batman and the JLA” which delves into Batman’s relationships with the other Leaguers. Also including a creative team commentary track and a digital copy of the comic book Justice League of America #43: Tower of Babel, this is a nice little set to give you a couple hours of nerdy goodness. This feature film was adapted and written by the late Dwayne McDuffie, the famous creator of the superhero Static, the creator of Static Shock, writer for Ben 10: Alien Force/Ultimate Alien, Justice League: The Animated Series/Unlimited, and several other DC Universe Original Animated Movies including All-Star Superman, which was released one day after his death. The film itself was very, very good story-wise. While it is based on the “Tower of Babel” storyline from the Justice League comics in 2001, McDuffie does take a few liberties for the sake of the story being less muddled and more comprehensible. The film deals with what happens when Batman’s contingency plans for taking care of the Justice League, should they go rogue, fall into the wrong hands. Things like changing the way certain heroes are incapacitated made more sense than it did in the comics, especially for Martian Manhunter and The Flash. Superman and Green Lantern’s were completely different from the comic iterations. But I was happy with the changes, as they make more sense logically, and from a storytelling frame. Part of the reason the story telling is so good is the voice acting. Led by Justice League Unlimited veterans Kevin Conroy (Batman), Tim Daly (Superman), and Michael Rosenbaum (The Flash), and also starring Nathan Fillion (Castle, Green Lantern: Emerald Knights) as Green Lantern and many other great voice actors, this film is not lacking in great vocal range. The dialogue sounds sincere and powerful, and lets you believe the gravity of what is going on. Some surprising voices also turn up here, such as comedian Carlos Alazraqui (known for voicing Rocko on Rocko’s Modern Life, Deputy Garcia on Reno: 911, and as the voice of the Taco Bell Chihuahua) voicing Batman-villain Bane. Actor Phil Morris (Seinfeld, Justice League, Smallville) turns in a great performance as Vandal Savage, the main villain of the film. As always, Kevin Conroy continues to show why he is THE voice of Batman for this generation. Conroy and Morris steal the show, and I look forward to hearing them work together again. The animation of this film is good, but not spectacular. The animation styles are the same used in the series Young Justice and Justice League: Crisis on Two Earths. While these are not bad, here it is not as impressive. I’d go as far to say that Young Justice looks better, as far as shadows and general fight scenes. The major fight near the end of the film is the exception, as it is spectacular. But, the animation is still very good, and I liked a lot better than the animation used for Superman: Doomsday and All-Star Superman. Overall, Justice League: Doom is another great entry into the DC Universe Animated Original movie line. It is one of my favorites, second only to Batman: Under the Red Hood, which is still my favorite. The Blu-ray edition is great, especially with all the special features. The best featurette, Legion of One: The Dwayne McDuffie Story is an awesome little piece that shines light on the man who wrote this adaptation, the late Dwayne McDuffie. It is one of the best features I have seen in a long time. While there are some frustrating little tidbits and plot holes, and a very short runtime, Justice League: Doom is still a great addition to any film collection, animated or otherwise.